As our corner of Dixie formally enters the summer months, there’s no relief in sight from hot temperatures. 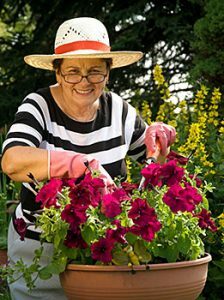 Seniors need to take special care because of their vulnerability to the heat. A few common sense tips can reduce the risks of dehydration and heat stroke for Chattanooga-area seniors. Heat and humidity are normal conditions this time of year. Therefore, we can anticipate and prepare. The seniors are Rosewood enjoy living conditions that keep them safe and comfortable. In fact, we plan events like July 20th Water Day to cool off in fun with squirt guns, water balloons, water color paintings and popsicles. Friends and family may not be so fortunate, struggling to maintain living conditions that are safe and tolerable. Seniors, infants and pets need to be checked on by friends, family or a professional caregiver during prolonged periods of intense heat. Some drugs taken for heart and blood pressure inhibit the ability to perspire while age-related changes such as poor blood circulation can increase the danger of overheating. According to the Center for Disease Control, the elderly lose their sense of body temperature as the brain cannot recognize the body is overheating. Prolonged exposure to the sun in very hot weather can have negative side effects when someone is on certain medications (e.g., anti-psychotics, tranquilizers, antidepressents, and over-the-counter sleeping pills). Someone with Alzheimer’s or dementia may lack the ability to communicate discomfort. Warning signs of heat exhaustion vary, but may include heavy sweating, muscle cramps, weakness, headache, nausea or vomiting, or dizziness. An extremely high body temperature (above 103° Fahrenheit) or a rapid pulse can indicate heat stroke. Someone in that condition needs immediate medical assistance. Stay in well ventilated areas to circulate fresh air. If someone needs relief but worries about their electricity bill, one solution is to go to a public space with air conditioning. Public libraries are full of free books, magazines, movies and more – some of them include the Catoosa County Library in Ringgold, the Rossville Public Library in Rossville, the East Ridge City Library in Chattanooga, the Chickamauga Public Library, the Eastgate Branch Library, Chattanooga-Hamilton County Bicentennial Library, South Chattanooga Branch Library, or the Ooltewah/Collegedale Branch Library. Matinee movie shows are another possibility at theaters like the Carmike Battlefield 10, Carmike East Ridge, Regal Hamilton Place, Carmike Majestic 12, IMAX 3D at the Tennessee Aquarium, the Carmike Wynnsong 10, or Carmike Northgate 14. There’s no reason for anyone to suffer through the heat. A little prevention and possibly an outing to a public space can keep seniors safe and enjoying the summer weather.